Through Playing or Playing Through? In a rare admission of failure, White House spokesweasel Josh Earnest conceded that the administration made a mistake by not sending any high-profile official to the anti-terror solidarity rally in France, which caused people around the world to wonder just whose side Barack Obama is on. Happily, any confusion was cleared up on Wednesday when, just after Al-Qaeda's branch in Yemen took credit for the bloody Charlie Hebdo terror strikes in Paris, the Obama administration announced that they were releasing five Yemeni terror suspects from Gitmo. For those of you keeping score at home, this means the radical Islamic terrorists lost three players in Paris last week but picked up five players from Barry this week - putting them ahead on the scoreboard by two. When asked about the seemingly insane timing of the prisoner release, Barack Obama said...well, he didn't say anything, because he's not letting anyone get close enough to ask questions. Besides, he's far too busy trotting around the country pushing free community college and free high speed Internet to talk about his newly-free terrorists. Time for a Hail Mary? 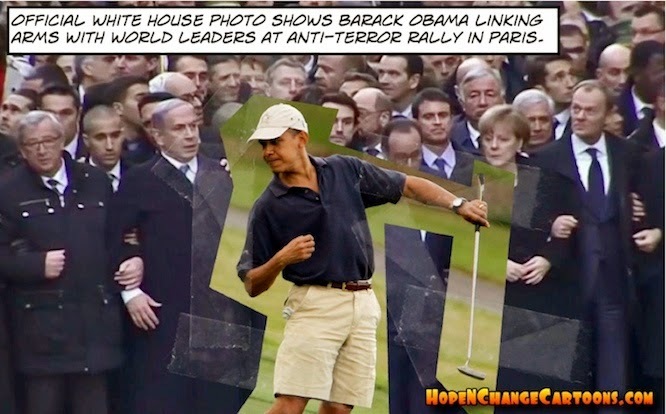 Even the White House admitted that they had made a faux pas by deciding that the huge anti-terror rally in France wasn't a big enough deal to change the busy, busy, busy schedules of Barack Obama and Joe Biden to allow them to attend. According to the White House activity log, both the president and vice president had a top level meeting with "Mr. Bubble," meaning Obama spent Sunday afternoon farting in the bathtub while Biden snapped at the bubbles, splashed and giggled. And in fairness, Sunday is a day in which ritual and tradition should be observed. Meanwhile the world was stunned by the lack of meaningful American representation in Paris, and clearly yearned to hear the heartfelt thoughts of an American president. Unfortunately, that president turned out to be Jimmy Carter, who appeared on the Jon Stewart show. Because nothing says "thoughtful analysis of geopolitical terror and the tragic loss of life" like appearing on Comedy Central. Carter explained that the killers were (ahem) "aggravated" because of what Israel is "doing now, doing to (the Palestinians)." OHhhhh! And here we thought it was those pesky drawings of Mohammed that inspired the massacre. But Carter knows better and, fortunately, he has an easy solution for the real problem! "Israelis have to withdraw from the west bank and Gaza and East Jerusalem as well," he explained, adding that in return, the Palestinians just have to agree to live in peace. Right. Frankly, Hope n' Change thinks it would make more sense for the surviving staffers at Charlie Hebdo to hire ISIS members as interns, and give them huge sharp knives to sharpen the cartoonists' pencils. While promising to live in peace, of course. Carter also said of the terrorist attacks, "I think this is a positive turning point in some respects because a lot of people now are trying to understand what do the Muslims really believe. Their beliefs are very similar to Christians as far as peace and harmony and so forth. I think, now, we'll have a better approach to cure (Islamophobia) in general." That's got to be the ultimate "glass half full" statement. And whatever the hell his glass was half full of, you'd better not drop a whole bottle of it because it will blow a smoking hole in the Earth the size of Bogota. While it's tempting for us to suggest that Mr. Carter needs to start wearing a helmet in the falling hammer zones at Habitat for Humanity sites, we really think that what will be best for humanity is if the former president checks himself into a Habitat for Humility house, which we'll personally volunteer to build. There won't be any doors, windows, telephones, televisions, or Internet. However there will be a slot through which Mr. Carter can get delicious, nutritious Michelle Obama approved school meals (sorry, no peanuts!) and, of course, a weekly copy of Charlie Hebdo. The new game the whole world is playing! 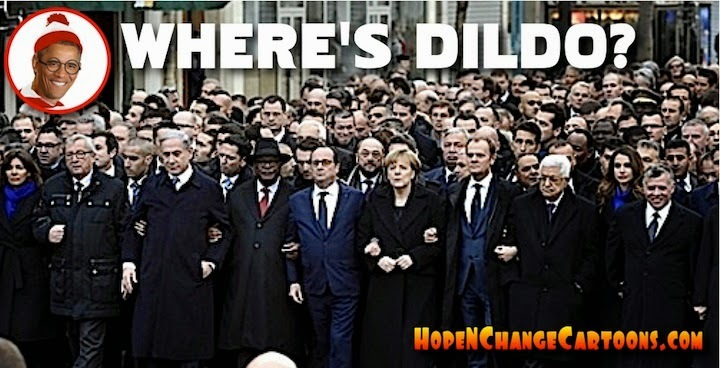 To prove once and for all that religious fanaticism and violence are absolutely unacceptable to Western civilization, 40 world leaders linked arms at a massive anti-terror rally in Paris on Sunday. Literally millions of freedom lovers took to the streets in the largest demonstration of its kind in French history. Standing tall against terror and ignoring personal risk were French President Francois Hollande, British PM David Cameron, German Chancellor Angela Merkel, Israeli PM Benjamin Netanyahu, representatives from Turkey, Italy and...and...oh, screw it. We can only stall so long. Barack Obama wasn't there. Of course he wasn't there! Just because a couple of days ago he declared that he would "stand with France" doesn't mean that he should actually have to, you know, stand with France. Especially on the weekend. Not that the United States was entirely unrepresented. Attorney General Eric "Isn't He Gone Yet?" Holder was already in Paris mounting an investigation into whether the terrorists had been read their rights and offered legal counsel before being shot by the over-armed and quite possibly racist French police. Holder did not, however, actually bother to attend the anti-terror march owing to a pressing brunch engagement at the Folies Bergère. 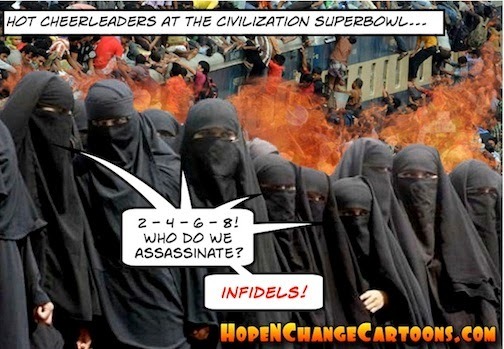 Still, despite all evidence to the contrary, Barack Hussein Obama isn't entirely uninterested in stemming the worldwide plague of radical Islamic terror. Just kidding! He is entirely uninterested and won't even admit that radical Islamic terror exists! But he has offered to host an international White House "Summit on Countering Violent Extremism" next month, at which he will explain his belief that truly violent extremists like Timothy McVeigh and Officer Darren Wilson might have been turned away from their blood-soaked paths if they had only been given two free years of community college. We don't doubt it for a minute, Mr. Kerry.